Cosmoteer update 0.14.0 is out! This is the first update of the "0.14.x" series which will focus on adding a plethora of new ship parts to the game. 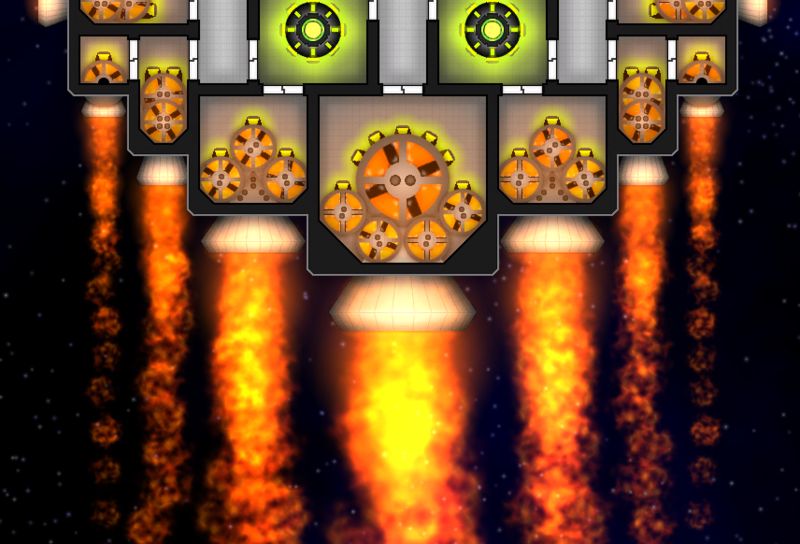 0.14.0, specifically, adds a handful of new thruster types and an Engine Room that buffs adjacent thrusters. It also makes some significant balance changes to thrusters in general and has a ton of other smaller improvements and fixes which you can read about in the changelog. These thrusters occupy the same space as the regular Small Thruster but can thrust in 2 or 3 directions, with the downsides being they are proportionally more expensive (costing 1000 for the 2-way and 1500 for the 3-way) and only have capacity for one battery, meaning they can run out of power faster than the regular Small Thruster. Hopefully these new variants will help to make small, maneuverable ships easier to build. The Huge Thruster is a 3x3 thruster that is more than twice as powerful as the 2x2 Large Thruster and is especially useful on giant capital ships. The Engine Room is a new support system that isn't useful by itself but increased the power (both thrust and power consumption) of adjacent thrusters by 75%. Because the Engine Room can be placed internally, it allows ships to exert more thrust in the same amount of perimeter area. 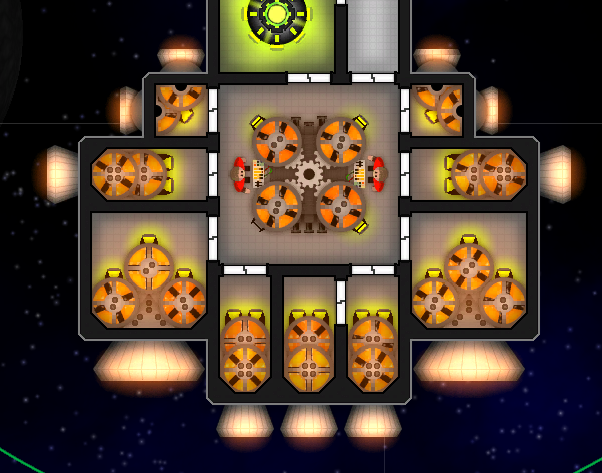 And the more thrusters you can fit adjacent to it, the more cost-effective it becomes, creating some additional strategy when designing ships. 2. None of the thruster can exert any "lateral" force anymore. (Previously, all thrusters could exert some amount of unrealistic "sideways" force.) This change was made to make the game simulation less "cheat-y" and more "authentic". 3. All thrusters (except the Small Thruster and its variants) now have a "ramp-up" time depending on the size of the thruster. The Standard Thruster takes 1 second to go from zero to full thrust, the Large Thruster takes 3 seconds, and the Huge Thruster takes 6 seconds. (There is also a "grace period" after a thruster turns off during which it can turn back on in much less time.) This change was done to make the choice of choosing which thrusters to use a more interesting one: if you want a very maneuverable ship that can respond quickly, use smaller thrusters; and if you want a fast ship, or you have a large ship that just needs a lot of thrust, go with the larger thrusters.